In October 2017, the Heller School welcomed Maria Madison as the Associate Dean for Equity, Inclusion and Diversity (AD EID), the first to hold this position. Madison has over 20 years of experience in evidence-based research and management, especially in the design and implementation of clinical trials both in the U.S. and globally. Throughout her career, Madison has managed multidisciplinary, multicultural teams in various challenging settings and consistently engaged with social justice issues. Madison is an educator, and currently holds an adjunct faculty position at the University for Global Health Equity in Kigali, Rwanda. She is also the founder and president of the Robbins House, Inc., a historic home and nonprofit organization focused on raising awareness of African-American history in Concord, Mass. Madison earned both a bachelor’s degree and a master’s in environmental policy and public health from Tufts University, and an ScD in population and international health from Harvard University’s School of Public Health. The creation of the AD EID position was largely advocated for by Heller students, many of whom participated in Ford Hall 2015, a 12-day student sit-in protesting a lack of diversity, equity and inclusion efforts at Brandeis University. Maria Madison can be reached at mtm@brandeis.edu, by phone (781-736-3886) or in Heller-Schneider office 119. The 2011 Heller Strategic Plan recommended developing “programs, policies and procedures that would embed equity, inclusion and diversity in the fabric of Heller’s academic and work environment.” In January 2012, Dean Lisa Lynch established a Diversity Steering Committee, first chaired by Professor Anita Hill and composed of students, faculty, staff and alumni, that was charged with developing programs that would bring diversity of all types—racial, gender, sexual orientation and identity, national origin, ethnic, socioeconomic and intellectual—to the faculty, research staff, administration and student body at Heller. In addition, the Committee was asked to play a lead role and coordinate initiatives that would foster an inclusive and welcoming environment for all members of the Heller community. My position as the first associate dean for equity, inclusion and diversity has its roots in these discussions. The school launched diversity programs as far back as 2014 that included training sessions, curriculum assessment and research review. The Heller community had entered a new world, and was experiencing an intense desire to better realize its motto of “knowledge advancing social justice.” Both the Strategic Plan and Diversity Steering Committee came on the heels of another cyclical era of tense relationships between law enforcement and minorities in this country that included the deaths of Trayvon Martin, Oscar Grant, Rodney King and Rekia Boyd, among others. Click to view and download the community forum notes. Click to view and download slide deck. I am going to take your ignorance as a teachable moment. Over 400 years ago my ancestors were stolen away from countries you called “shitholes,” by people from countries you deem represent a better class of people. My ancestors were brutally parsed between those who were “seasoned” (i.e., beaten and tortured into submission, ears slit, backs lashed to a pulp, bodies packed alive into coffins) to become free laborers versus those who were forced to walk the plank through the Door of No Return, fed to awaiting sharks if they seemed unsuitable for ocean travel. Who does that? In the heart of the deal, Europeans absconded millions of Africans to provide free and skilled labor in creating America. These earliest Africans trained the new pilgrims in planting techniques that staved off hunger of the earliest colonies, built the White House and railways, created the elevator, refrigerator, lawn mower, furnace, the blood bank, open heart surgery, etc. Among them were my ancestors, and possibly yours too. The earliest Africans were beaten and dehumanized and worked long hours each day with limited rations and no pay. What a deal. When their ranks were reduced by the abolition of slavery, they were raped to create a replacement yield of free labor. I am that legacy with my family’s fair skin. Those who resisted were lynched. Who does that? My ancestors bought 40 acres and a mule—though it was promised to them for free—and then more land and created machinery and devices that benefitted their families and their communities. Despite bigotry, they were among the fortunate who could climb out of poverty. Others succumbed to the relentless dehumanization over generations, exploited. Who does that? So here is the educational lesson. Deep within each of us is a hero, a genius, an artist, a mathematician, a resilient entrepreneur from a mosaic of deep ancestral global roots. Deep within each of us lurks an idiot, an ignorant bigot, a blind man or beggar from somewhere around the world. Which do you choose to unleash? What of your ancestors will you carry forward? Will you carry forward their industry, the ways they built their wealth? How did they find the courage to overcome the odds? Was it off of the backs of free and/or exploited skilled labor; the art of the deal? Where are you from? What are your ancestors’ stories? How do you define a shithole country? Certainly there are shithole people, who exploit people for profit. To condemn nations from whom the global culture has risen is just stupid, the kind of stupidity that pollutes the world and places subsequent generations at risk. A lesson from Martin Luther King Jr.
Download to continue reading Maria Madison's Month 3 memo (PDF). Download to continue reading Maria Madison's Month 1 memo (PDF). Bethany Romano, Heller Communications: I’d like to start our conversation with the larger context of positions like yours—chief diversity officers and deans or associate deans of diversity, equity, inclusion, and/or belongingness. It seems that these kinds of leadership positions are becoming more and more relevant—and prevalent—in higher education. What are your thoughts on that? Maria Madison: Absolutely. We’re seeing a shift in our educational system, towards a more conscious effort to meet the demands of educating an incredibly diverse population. There’s greater awareness that the previous approaches have often left marginalized populations behind. Elite institutions that are trying to make a difference, such as many Ivy League schools, as well as Heller and Brandeis. These institutions have made it a priority, based on student demands, to become increasingly diverse. But as they try to recruit enrollment for diversity, they are not necessarily nurturing these students or recognizing the challenges they may have experienced. In 2017, nearly 80 American Colleges and Universities won the Higher Education Excellence in Diversity (HEED) Award created by “Insight into Diversity.” The award measures an institution’s “level of achievement and intensity of commitment in regard to broadening diversity and inclusion on campus through initiatives, programs, and outreach; student recruitment, retention, and completion; and hiring practices for faculty and staff.” One of the goals of the award is to “help institutions assess their diversity efforts in order to build on their success and improve where necessary.” The award also provides avenues for increased community pride, marketing opportunities and quality improvements in education outcomes and careers. Heller will use the HEED award metrics to benchmark progress, based upon national standards. Through this process, Heller seeks to achieve progress within a reasonable period of time. Ultimately Heller would see improvement in recruitment, retention and satisfaction across the community. The themes by which colleges and universities are judged parallel the list of demands from Heller students: diversity, equity and inclusion (belonging) in pedagogy, faculty, staff, student body, facilitation and training on communication, hiring, curriculum development and classroom communication. Various schools across the country have achieved HEED “Champions” status. The 2017 awardees include Columbia University, Indiana University, Kent State University, and the University of Cincinnati, among others. Let’s strive together for Heller to join the list of Champions, as defined within our school (preliminarily independent of the University). This process requires behavioral change rooted first in an awareness of implicit bias. My proposed process for working toward the HEED Champion status begins with a parallel approach that includes formal and informal approaches. The formal channels include working with colleagues to create pathways towards standards and policies regarding recruitment, retention, and curriculum, for example. Informal channels include one-on-one discussions, coffees and lunches with select students, faculty and staff. Through these parallel approaches, I hope to build consensus around a work plan to advance our DEI objectives (objectives which align with HEED metrics). While we can expect some early wins, this process can take many months and years. Thank you for your patience in rolling out these ideas and plans. I look forward to speaking with as many individuals and groups as possible to bridge the Heller divide. 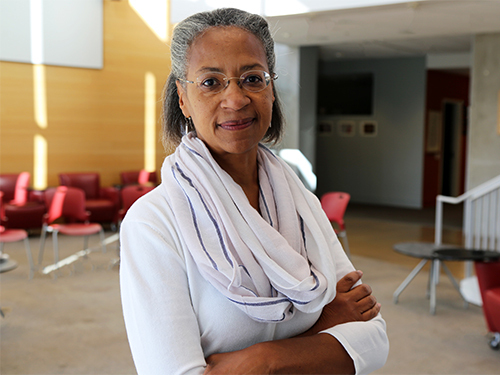 Waltham, MA—The Heller School for Social Policy and Management at Brandeis University has selected Maria Madison as the Associate Dean for Diversity and Inclusion (ADDI), the first to hold this position. Madison has over 20 years of experience in evidence-based research and management, especially in the design and implementation of clinical trials both in the U.S. and globally. Throughout her career, Madison has shown a strong ability to manage multidisciplinary, multicultural teams in various challenging settings and has consistently engaged with social justice issues.